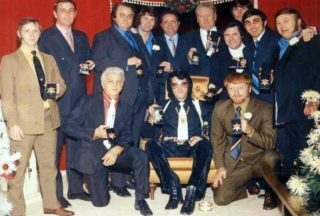 Who are the Memphis Mafia? 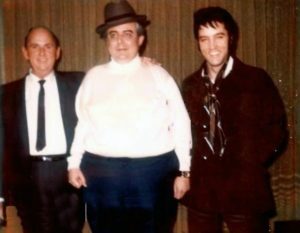 Remembering Elvis Presley with the Memphis Mafia Lamar Fike, Elvis’ tour manager, so close to Elvis he even tried to go into the Army with him, but couldn’t. Jerry Shilling still finds it hard to discuss all the time he spent with Elvis. Marty Lacker to be honored by receiving a Beale Street Blues Note, the equivalent of a Hollywood Walk Of Fame Star Lacker started his entertainment career in radio in 1957 and a few years later his former high schoolmate, Elvis Presley, asked Marty to work for him. 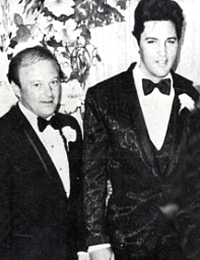 Marty was with and close to Elvis for 20 years and served as his right hand man as well as being his Best Man at Elvis Presley wedding. MARTY LACKER: Odd. He was sort of loner. The thing we had in common, because we weren’t that close, I had just moved from New York. And Elvis dressed in very flashy clothes, which was different than the kids back then. Most of the guys back then wore crew cuts and Levisand t-shirts. And Elvis wore flashy clothes, wore his collar up, his hair was a lot longer than the rest of the people. And basically, I dressed the same way, coming from New York. And the kids used to kid us about who was going to out dress who the next day. 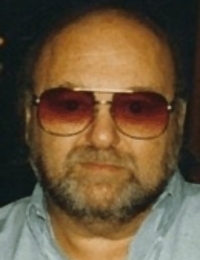 LAMAR FIKE, ELVIS PRESLEY’S TOUR MANAGER: No, not really. I travelled with him, Larry. It was a case of — I did most of the lights in Vegas. And when we went on the road, I’d do some of it. But, you know, we were there mainly to kind of keep everything together. At times we didn’t but it was still fun trying. FIKE: At times, very difficult, but most of the time, he was a lot of fun. You know, you’re around somebody like him 24 hours a day, and you have to watch what you’re doing because you become a little too familiar and you say things you shouldn’t and sometimes you get in arguments. And it was a constant amount of pressure. It never really stopped. It kept you on your toes. JERRY SCHILLING: Well, it came about, Larry, I think years ago, we used to go to Vegas and wear Mo hair suits and carry guns. And the press kind of affectionately started calling us the Memphis Mafia is back in town. And we kind of liked it. We were young guys. KING: How many people were involved in the Memphis ? SCHILLING: Normally six to seven at one time. Probably over the years, there’s been about 12, 13 guys. SCHILLING: Well, you know, it kind of looks that way from the outside. But on inside it was very important — first of all, he didn’t go out and hire people because they were an accountant or a tour manager, he hired people that he trusted and then you worked into the position. LACKER: I was two years younger than him. We both were born in January. I have got to say this about hangers on. We’ve been called every name in the book, but we’ve been called those names by people who have no understanding what our relationship was about. LACKER: It was a close brotherhood. Elvis didn’t have one best-friend, he had about 9 of them. And those were basically the guys from the early years. And we grew up together. We were like brothers. The people who make statements like that, I mean, we just smile and laugh, because they have no idea what it was all about. FIKE: Yes. That’s probably the nicest thing you could think of. When he got hard nosed, you knew he was there. He could make it hard on you. It’s just like I said, it’s hard to really separate the lines. You’re friends and you’re an employee and you’re all the above. My thing was we just fought all the time. And I always lost. I got fired about 500 times. But it’s all part of it. The only time I ever heard him say I’m sorry, is he said it to me because of an argument, the one and only argument we ever had. And it shocked me when he did it, because he just didn’t do that. He’d go buy you something. FIKE: To say the least. I went through a lot of cars. You know, you — it was, you know, he got on a motorcycle tear. You know, I had a motorcycle and ran it under a bus. And you know, things like that. And we — you know, it was like — it was like a big playground that really got serious at times, but you know what? Somebody asked me the other day, said, would you do it over again, I said, when do we start? SCHILLING: Three movies a night. We’d go at 12:00 o’clockafter it closed. We would talk out loud. It was interesting, Larry, because I think about now, and how you sat in the movie theater with Elvis was the relationship at the time. Is that right, guys? SCHILLING: Elvis studied those movies. I used to wonder, why are we watching this for three times, you know, and then he would see some little eclectic thing that he picked up from that movie in his next movie. LACKER: One of the things about him, is he’d hardly ever watch one of his movies. LACKER: Well, he did a couple of times, but only about two or three that I knew of over 20 years. He just — he didn’t like to see himself on the screen. And we drove around Memphisa lot, we stopped by a hamburger place, and sent Lamar in for I don’t know how many dozens of hamburgers, Lamar, lots of them, and they ate every one of them. And then we went to Graceland. He had just bought Graceland, and he wanted to show me Graceland, and we went out there. KING: Did he try to lure you the first night? Did he make a move? ANITA WOOD: He tried. He wanted me to go upstairs and see his bedroom and his big magnificent bed, which I did. And we walked in the bedroom. And it was a huge bed, I mean, the biggest bed I’ve ever seen, bar none, even now. A huge bed. And then he tried to make a little move on me. And I said, no, really, I have to go home now. So he took me home. And that was the first date we had. He was a gentleman about it. He took me home. KING: What was it like to be in love with? I imagine you were in love with him? WOOD: I was. He was my first love. I met him when I was 19 years old, and I came from a very conservative family and I’d never gone steady or anything. So of course when I met Elvis, I did fall in love with him, and he did with me. 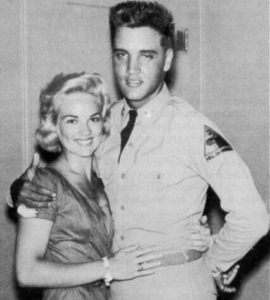 He went to Germany and while he was there, of course he met Priscilla, who was a beautiful, l pretty young girl at 14. But when he came back, we still continued to date. And of course, you know, Elvis could make you believe anything in the world, so he had me believing that she was just a friend and her daddy was in the Army with him, and there was nothing to it whatsoever. SCHILLING: “Star Is Born.” He accepted to do that film. SCHILLING: Oh, absolutely. And they take — they take those things away. KING: What happened? Why didn’t he do it? SCHILLING: Well, you know, if it doesn’t coming through, management, there’s… Colonel Parker killed that deal. Elvis was a huge fan of Bobby Darin. 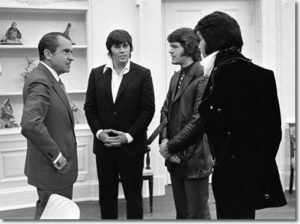 Elvis met with Bobby, and said, Bobby, that’s not you, man. Man, I want to hear “Mack the Knife” when I see you. I want to see you on stage. And Bobby went back. I don’t know if it was right after that, but it was amazing. SCHILLING: I enjoy visiting Memphis. Graceland is bittersweet. My best memories in life is living at Graceland . And I loved the way it is. But you know, it’s an emotional thing to go back there. And I loved Memphis, it’s my hometown. I came out here with Elvis many years ago. But I think they have kept Graceland just as it was when we lived there.